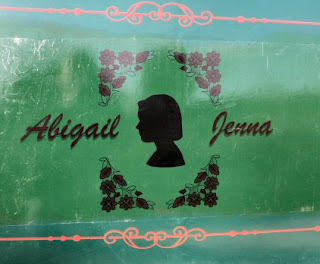 narrowboat_Abigail_Jenna: Then three came along at once! I had a quiet night at Washingborough. During the day carried out some of the odd jobs that needed doing to fill in time. While having a skive down below with a cuppa I heard a boat horn going off and went out to have a look. It was the first of three boats from Blue Water Marina in Thorne that were returning from a trip to Boston. 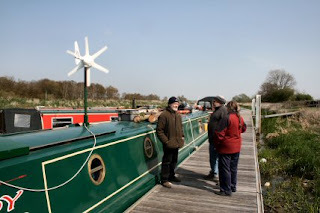 They had moored at Saxilby behind Abigail Jenna for lunch on the way down but everyone was out at the time with myself at Barton and Karyn and Andy out visiting. One of the things they attempted while at Boston was to have a look at some of the drains and in the course of which one boat had to be towed stern first to get out. Some of the bridges are rather deficient in headroom and everything had to be cleared off the roof. They were very nearly stuck on the wrong side of the bridge when the water rose slightly and the clearance became even less. Chris has decided that drains are not fun. After the three were moored up a long pontoon chat ensued and another three boats came around the bend. These were trailable and they had also been down the drains with no problems. Using outboard motors they are highly manoeuvrable and nip about quite happily. First thing this morning its off to Bardney Lock to take a look at fixing the name plate on to the boat. I had only just arrived when I had a text saying that Heidi and Syd were enjoying a bit of ‘gangoozling’ at the lock. After letting them in to the mooring I made a cup of tea to go with the Red Cross Parcel of hot cross buns Heidi had brought. And very nice they were to. So as I was to turn the boat around I took them back to the lock were I dropped them off and made my way back to the pontoon. Fitted the name plate this afternoon but I shan’t put the other on as I don’t really like the effect with the lettering on top of the green paint. I think it needs a white background to show it off. That and the fact that as I got to the end the plastic stretched and I ended up with a few wrinkles in it means that at least it will be better next time.